‘Nodal orientation’ was highlighted as a key concept in the new police strategy. Derived from the work of Manuel Castells (2000) on the network society, the police distinguished a space of flows alongside a space of places, urging them to take up a new strategy concentrating on the nodes and flows constituting the space of flows. In their own words: ‘the nodal orientation (“infrastructure policing”) leads to surveillance of the infrastructure, or rather, the flows of people, goods, money, and information that use the infrastructure to move from one place to another’ (Castells 2000). In order to realize this surveillance of flows, the police needed to develop information-driven working methods and secure the exchange of information with partners in the safety domain (Board of Chief Commissioners 2005). 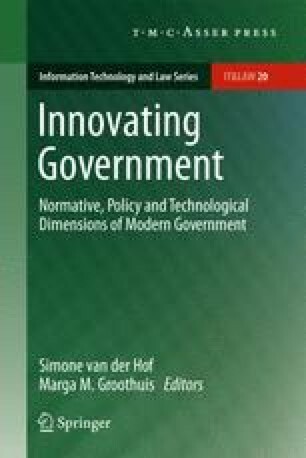 An earlier version of this chapter was presented to the Study Group on Information and Communications Technologies in Public Administration at the 2009 Annual Conference of the European Group on Public Administration (EGPA), 2–5 September 2009, St Julian’s, Malta. We need to change course before it is too late. Board of Chief Commissioners 2005, p. 4.